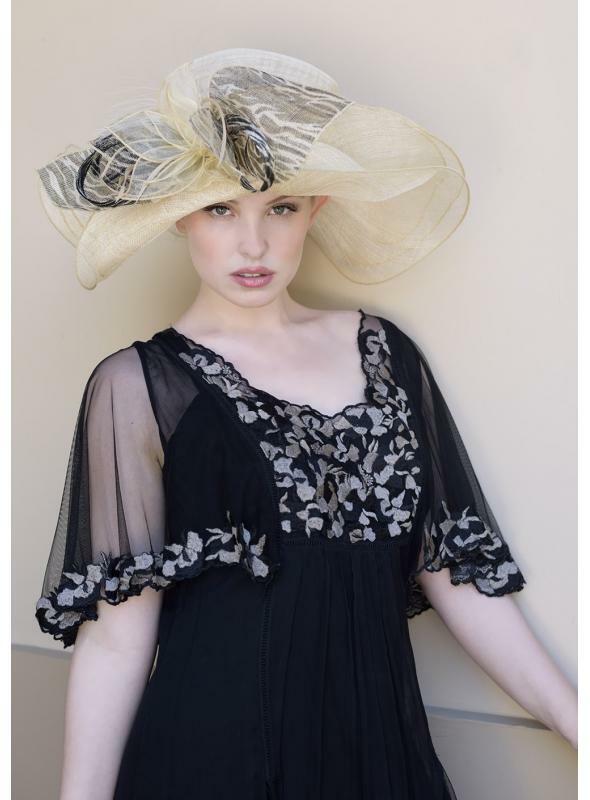 Lady Linda Hat by Louisa Voisine Millinery. Fast worldwide delivery. Click or call 323-592-9172 for more info. Louisa Voisine: "This design is a little bit of a different inspiration than the others. I was inspired to design this hat by ironically the over use of animal print in today’s fashion accessories. This design shows just a hint of animal print keeps fashion classic and tasteful. " This sassy Lady Linda hat by Louisa Voisine Millinery is fierce and flirty with neutral shades of black and off-white that make this hat a versatile accessory you can wear with lots of different pieces in your wardrobe. The wide gauzy brim is layered and curving for a very feminine look. A classic zebra stripe pattern is fierce with long curling feathers in the same pattern accentuating. Additional feathers in off-white add softness, with a lovely gauzy flower with pointed petals perfectly complements the other elements of this design.